BT Dark Green is my first Wordpress conversion. Originally created by Blogging Tips, this is a slick and professional looking widget-ready theme (for Layouts blogs) with mouseover effects for sidebar links and navigation tabs. 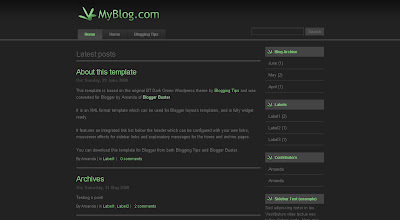 You can see the BT Dark Green template for Blogger in action here. This template is very easy to set up and configure to your tastes. Simply download the XML template, upload this as a complete file to your blog, and add links as required in the "Link List" widget (which is built into the template). A "Home" link is already set up to lead back to your blog's home page. Once installed, most of the fonts and colors can be changed through the Fonts and Colors section of your blog's dashboard, so if the default color scheme is too dark for you, this can be adapted to your personal needs. The sidebar links and tabbed navigation buttons feature a nice mouseover effect to complement the color scheme of the template, and sidebar headings all have the matching icons to complement the green highlighting. In the demo, the header includes a custom logo to match the theme. You can download this and change the title to suit your own blog. If you prefer not to use this logo, the header will instead include your blog's name and description (or you could design your own header banner instead). There is also a built-in blog search function, which uses the default Blogger search function to return entries from your archives. You may also notice on the Home and Archives pages that a message appears above the posts ("Latest posts" on the home page, and "Archives for [day/month/year]" on archive pages. First you need to download the BT Dark Green template. This is an XML file contained in a Zip folder (which also includes instructions for use). Once downloaded, unzip the contents of the folder and save to a location on your hard drive. Log in to your Blogger dashboard and select the blog where you want to install this template. Go to Layout>Edit HTML and look for "Upload a new template from a file on your hard drive". Click on the "Browse" button, and locate the bt-dark-green.xml file on your hard drive. Then select "Upload". This will upload the complete template file to your blog. Please note that you may be prompted to delete some existing widgets when uploading this new template. This happens when installing any third-party template. If you need to retain all of your existing widgets, you can either make copies of the content to save on your computer, or transfer widgets over using the method described on this page. I hope you enjoy using the BT Dark Green template! This is my first ever Wordpress theme conversion, though in the next few weeks I hope to convert other Blogging Tips themes for use with Blogger blogs. Please let me know what you think (and also if you experience any problems with this template) by leaving your comments below. PS: I've almost finished my next eBook: Choosing and Using a New Blogger Template which includes detailed informations and methods for all your template needs. Be sure to subscribe to Blogger Buster to learn when this eBook is released for download.